Roadies is packing up the stage. This week, Showtime announced the series has wrapped production on its first season. From Cameron Crowe, the show explores the lives of the people who make live music happen—the backstage crew. 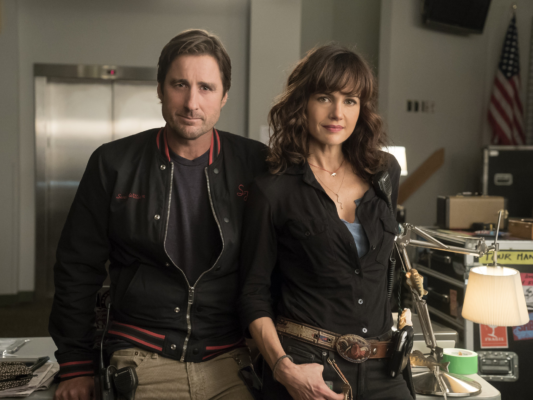 The cast includes Luke Wilson, Carla Gugino, Imogen Poots, Rafe Spall, Keisha Castle-Hughes, Peter Cambor, Colson Baker, and Ron White. The season one finale of Roadies airs on August 28th at 10 p.m. ET/PT. NEW YORK, NY – July 13, 2016 – Today, SHOWTIME wrapped production on the first season of the freshman music series ROADIES with an impressive roster of musical acts set to appear in the season finale, which will air on Sunday, August 28th at 10 p.m. ET/PT. The one-hour episode will feature music personally curated by series creator, executive producer, writer and music supervisor Cameron Crowe, and performances from Jim James, Eddie Vedder, Nicole Atkins, Jackson Browne, Robyn Hitchcock, Jess Wolfe and Holly Laessig from Lucius, and Gary Clark Jr. The ROADIES soundtrack will be released by Republic Records and Stardog Records. Previously announced tracks include “I Wish I Was Sober” by Frightened Rabbit featuring Mike McCready, “Are You Satisfied?” by Reignwolf, and “Big Love” by Lindsey Buckingham. The hyper-eclectic music featured on ROADIES includes works from artists as wide-ranging as Bob Dylan, The Ramones, The Replacements, The Ting Tings, Jeff Buckley and more. Many of music’s best are appearing in the series, including Lindsey Buckingham, The Head & the Heart, Lucius, Halsey, Jim James and Reignwolf, who also contributes some of the score for this season’s second episode. Joy Williams (The Civil Wars) guest stars. Crowe, with help from ROADIES producer and Stardog Records label president Kelly Curtis, hand-picked the genre-bending, decade-spanning mix of new and classic rock, indie, folk, bluegrass, electronic, and blues and more. Featured music includes an extremely rare, never-before released cover of Bob Dylan’s “Farewell Angelina” by Jeff Buckley and Gary Lucas, “Dreams of Flying” off of Tom Petty’s band Mudcrutch’s recent record, Buckingham’s “Bleed to Love Her” and “Big Love,” Hannah Huston from The Voice on “I Can’t Make You Love Me,” “Loudmouth” from the Ramones and “Given to Fly” by Pearl Jam. The songs will at times reflect some of the Staton-House band tour stops – in the episode in which the band performs in Atlanta, the music includes “Kick Your Game” by the Atlanta trio T.L.C. and the live version of “Oh Atlanta” by classic band Little Feat. Curtis, who has managed Pearl Jam since the band’s inception in 1990, worked on several of Crowe’s films: as a researcher on Say Anything, an associate producer on Singles, and a tech advisor on Almost Famous. What do you think? Have you seen Roadies? Do you think it will be renewed? To me roadies is like the new mash, you can’t get enough.How can they cancel when folks are begging to keep it on.This show for sure is not for everyone,it’ sappy it’s lovely it’s soft and very human,i’m not going to beg but boy it would be great to see roadies on sunday. as they say thanks for the memory’s copy that. lance from sad Miami fla.
My favorite show of the year. Please don’t cancel it. I can’t wait to find out what happens next. To me the Roadies cast felt like family.